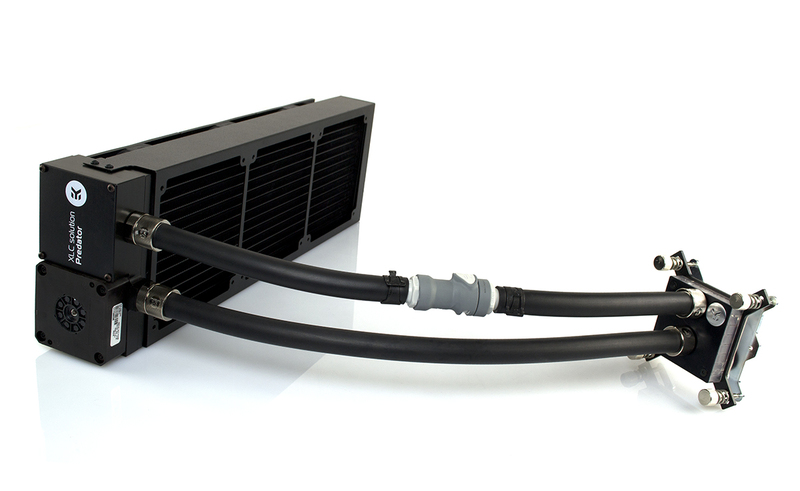 EK-XLC Predator is setting a new standard for AIO liquid cooling! EK Water Blocks, premium PC liquid cooling gear manufacturer from Slovenia, is proud to announce EK-Predator AIO product line, the next big thing that will shake up the liquid cooling market. 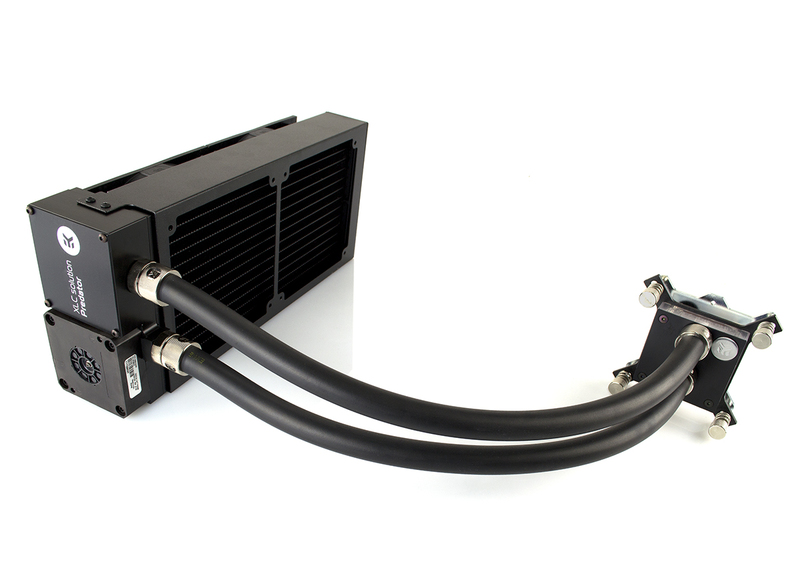 Originally custom loop parts manufacturer for enthusiast segment is now offering high end complete all-in-one (AIO) liquid cooling solutions for the mainstream market. 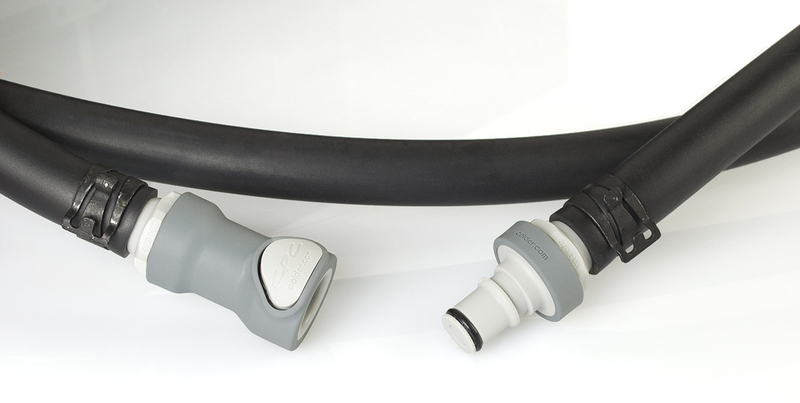 HovercoreTM is a new, revolutionary design of radiator dampeners that prevents transfer of pump vibrations further down the unit and into the chassis, thus resulting in vibration free and silent operation. SupremacyTM MX CPU water block, top performer in Enthusiast segment, is specifically designed for Intel CPUs and offers great hydraulic and thermal performance. Carefully machined copper base is made from purest copper available and is further polished to absolute mirror finish. This alone greatly improves the cooling performance of the block. CoolStreamTM PE radiator – 240mm or 360mm, has a full Copper core being superior to aluminum alternatives in terms of heat dissipation. In conjunction with EK-Vardar fans the result is increased performance across an entire fan operational range, thus delivering results both at low and high airflow operation. VardarTM fans – two on Predator 240 and three on Predator 360 – are high static pressure fans developed in-house specifically for liquid cooling systems. With low noise profile and PWM technology built in, you can always control the RPM and keep the fans silent while maintaining excellent cooling performance. Dimensions of the main radiator unit on Predator 240, with integrated pump and reservoir are: 295 x 133 x 68 mm. This allows mounting of unit in most modern computer cases. Predator 360 is a bit bigger beast, measuring 415 x 133 x 68 mm! EKWB will provide a list of compatible cases before launch. 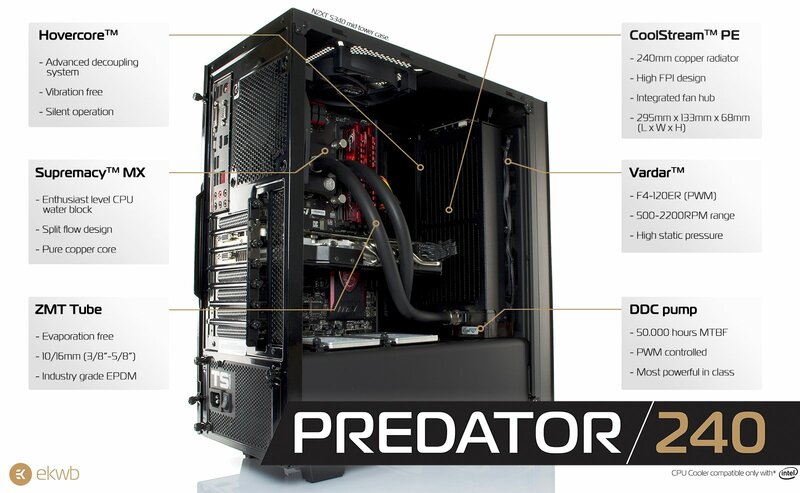 EK-Predator 240 will launch on September 23rd 2015, priced at 199$/199 EUR, with EK-Predator 360 following on October 19th 2015, priced at 239$/239 EUR. Both units will only be available for Intel CPU sockets. AMD versions are planned for release in 2016. Preorders for EK-Predator 240 will start on 23th of August at http://predator.ekwb.com and at selected EK resellers. EKWB is commemorating this historical moment with FREE Express Worldwide Shipping on all Pre-orders placed directly at EK web shop.